How did your interest in jewellery come about? Well my first experience was when I was around 16. I used to live in Europe and my grandfather lived in New York. He was a surgeon and he indulged his passion for making jewellery, so I used to sit around the work bench and started making pieces with him. I was probably the first 16 year-old to give jewels to girls. My first girlfriend got earrings – they were gold drops with semi-precious stones, and didn’t cost me anything because I made them myself. What was a memorable present you gave your wife? My wife is a designer and I bought her clothes once. She hated them. So I thought that if she doesn’t like my taste in clothes she probably won’t like my taste in jewellery. I bought her a pair of diamonds, thinking we could design a pair of earrings together. And I never saw them again. Before Christmas I suggested getting them out and making earrings and she wasn’t too sure. So I asked her what was wrong and she thought the diamonds were too small! So we made it a double Christmas present by getting bigger diamonds and making earrings. That’s our kind of romantic gesture! Tell us about the Encordia Collection. It’s always a long process with a Forevermark collection. We started with the idea of a bond of love. Bonds or ties, ties are made with rope, from there it got to the idea of knots. The strongest knot is a Hercules knot. So the collection is built around the idea, and if you imagine the knot in fabric, it won’t hold if you take the diamond out. So at the heart of the idea is the concept that because the diamond is eternal, the bond will never be broken. The Academy Awards were last month. 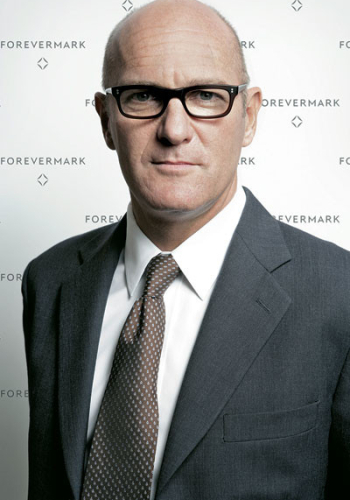 What was your favourite Forevermark piece at the Oscars? That’s an unfair question isn’t it, because Norah Jones wore Encordia earrings. How can you not be happy about somebody wearing something you do? What is your favourite piece of Indian jewellery? Two pieces without a doubt – the bangles and the mangalsutra. They aren’t a part of anyone else’s tradition and you can wear them anywhere in the world. Are you seeing any trends in diamonds for the Indian market? There are more fancy diamonds these days and we are beginning to see more pear shapes too. I wouldn’t want to say that it’s a trend but what’s happening is that people are beginning to want to wear pieces that they feel are more their style, so a young woman might want a cushion cut engagement ring and she’s got the courage to say it. The ability of the man to understand what the woman wants and to try to get what she expects, it’s not easy.